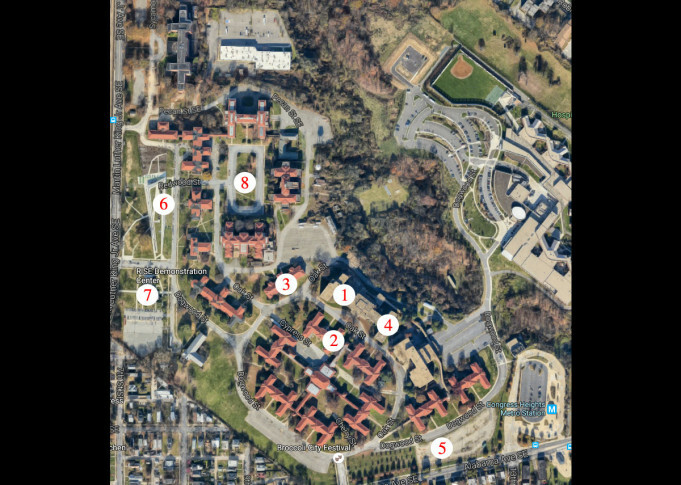 Can St. Elizabeths sports complex be Ward 8’s Verizon Center? D.C. is hoping the new Mystics arena and Wizards practice facility can lead the way in the revitalization of the St. Elizabeths campus in Ward 8. The St. Elizabeths redevelopment has begun, with the planned Entertainment and Sports Arena (ESA) housing both the new Washington Mystics arena and Washington Wizards practice facility, serving as the primary piece of construction and community engagement. This map and the photos to follow helps show what the site looks like on the ground as construction begins. WASHINGTON — The blueprint is simple, if clichéd: If you build it, people will come. That’s the idea the D.C. government and Events DC have put forth to try to revitalize the long-abandoned, 346-acre St. Elizabeths hospital campus in Ward 8. The west side of the campus flows down the hill to Interstate 295 and includes the sparkling new US Coast Guard headquarters visible from the highway, and will soon include the Department of Homeland Security. But the east side is the center of a different kind of development, one through which the city is hoping to use sports and other live events as a driver to not just build new construction, but actually re-energize a part of the city long ignored by many of its residents. “If you give people a reason to be over here, it will spark interest,” Erik Moses, senior VP and managing director of Sports and Entertainment for Events DC, told WTOP in a recent interview. It’s the principle that drove the investment in the Verizon Center, which became the centerpiece of downtown redevelopment 20 years ago. Of course, Gallery Place was ideally situated for such growth, geographically centered in the middle of the metro system, not far from other parts of the District that were thriving at the time. The Congress Heights Metro station, along the south end of St. Elizabeths, is just two stops past Navy Yard on the green line, making it easily accessible. It remains to be seen, though, if it will be a harder sell to bring additional foot traffic from across the river to a neighborhood many may be entirely unfamiliar with. But it’s a mission the city and Events DC consider worthwhile, enough that they have invested themselves in its success both financially and physically. Events DC will spend $65 million to construct the new Entertainment and Sports Arena (ESA) — which will serve as the new home of the Washington Mystics, the Washington Wizards’ practice facility and home to other sports and entertainment programming — in the middle of the St. Elizabeths redevelopment. The group’s offices will also move from their current home at RFK to the ESA upon the building’s completion. That number was revised up from the original projection of $55 million, based on an additional $7.5 million in programmatic costs and $2.5 million for additional contingencies that may arise over the course of construction. The way Events DC is funded, though, means these increases won’t come from any taxes on residents. The city has secured more than $100 million in additional funding for the surrounding buildings through 2021. The goal is to eventually develop 1.8 million square feet of office space and 275,000 square feet of retail space around the 163-acre east campus. There are also 1,300 residential housing units planned, at least 30 percent of which are dedicated to affordable housing, and including some opportunity for homeownership. At completion, the facility aims to create 6,500 full-time jobs. That starts with the ESA, which recently finalized its configuration in order to try to accommodate as many other, non-basketball events as possible. The original plan called for a continuous seating bowl, but will now be a 4,200-seat split bowl, which contributed to the additional cost. Moses said he’s spoken with NCAA conferences about bringing games in as well, trying to get a feel for what amenities the facility needs to attract the largest number of potential events. He also wants to make it as attractive as possible to potential sponsors, something the city is simultaneously doing with the site at large from an investment standpoint. “We’re starting to get folks from the area and outside the area interested in investing in and occupying space at the facility,” Joaquin McPeek, director of communications for the Office of the Deputy Mayor for Planning and Economic Development told WTOP. Before the arena even opens its doors, the city is looking to find ways to get the existing RISE Center and Gateway to become reliable and familiar community meeting places though which they can eventually tie larger programming. The recent Broccoli City Festival, which used much of the area from the Gateway toward the ESA site, drew better than 10,000 attendees. The first focus of the larger St. Elizabeth’s plan beyond the ESA will be getting residential and commercial pieces built. They will likely still be under construction when the ESA is first scheduled to open its doors in late summer/early fall of 2018, but will include some new commercial construction along Alabama Avenue closer to the Congress Heights Metro stop, and over 250 units of renovated residential construction. Phase I includes upgrading and replacing existing infrastructure, everything from replacing water and gas lines to updating electrical connections and installing street lights. There’s also the issue of demolition of what McPeek calls “non-contributing buildings,” those that can’t simply be retrofitted to accommodate a repurposing. Those in zones 9 and 12, where the ESA will be installed, have already begun to be razed. The remaining construction on site will still be ongoing when the ESA opens its doors. There are no final renderings yet, but Moses hopes to share them later this year before construction begins in 2017. There are still details to work out, but similar to the planned RFK redevelopment, Events DC is trying to take a more transparent approach with their designs, soliciting community input before anything is finalized.